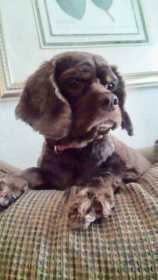 Our Cocoa that was supposed to stay when I took her brother Schnauzer, took off after a cat. Friday night at 9pm. We searched all over, put up signs all over the neighborhood. We’ve had her since birth and she doesn’t know and hadn’t ever been with anyone else. She’s chocolate with blonde parti marks. I just gave her a haircut so her legs are short haired too. She kinda looks like a miniature hound.